PHOTO BY JACOB GURNEY Church members (from left) Ron Burlile, Marcia Burlile, Linda Webster and Columbian High School student Ainsley Sherman pack boxes as part of Operation Christmas Child at The Journey Church, 2531 S. SR 100, Sunday evening. Members of The Journey Church, 2531 S. SR 100, and women from CROSSWAEH packed about 75 shoe boxes as part of Operation Christmas Child Sunday evening. 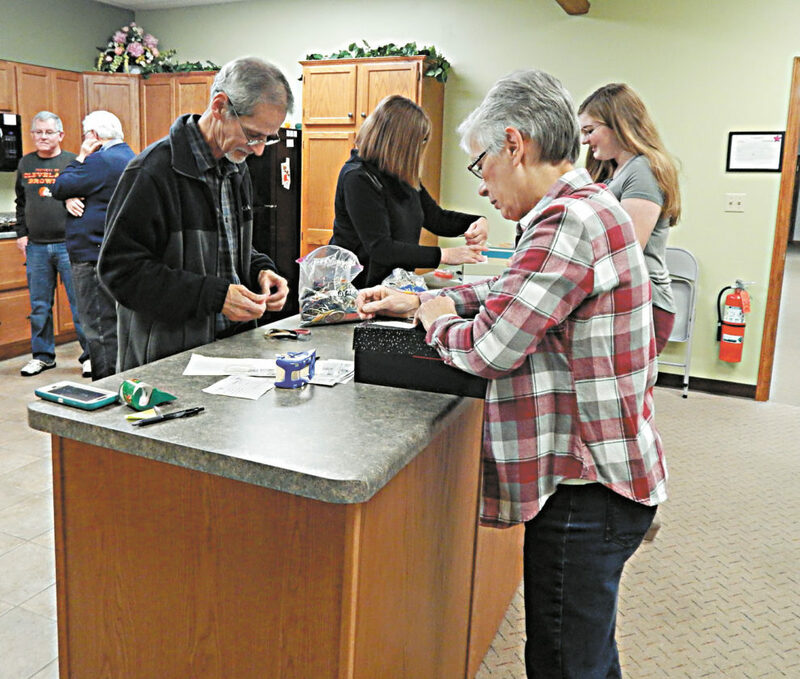 Church member Cynthia Ramsdell said Operation Christmas Child, a part of Samaritan’s Purse, focuses on sending hygiene items, school supplies, toys and handmade or unique items to underprivileged children around the world. Operation Christmas Child began in 1990, and The Journey Church has been participating in it for at least 10 years, she said. Church member Brenda Covert said Operation Christmas Child as a program is not just about sending shoe boxes, but it is an opporturnity for them to tell the children about Christ. “Hopefully, they are able to make that connection with Christ and learn about him and follow him,” she said. Ramsdell said a Gospel tract in the children’s local language is sent with each box. Ramsdell said the national organization makes promotional videos that the church shows to get members excited about making the boxes. After Christmas of 2015, the video had other volunteers that worked on the boxes with people from a halfway house, she said. She said church members began inquiring if they could come in once a week and have the ladies make handmade crafts to put in shoeboxes and about five to six church members did it for 12 weeks with the women at CROSSWAEH in 2016. Ramsdell said they had so much fun they didn’t want to stop going, so they asked if they could continue, which they have. The weekly gathering is called “Christian Crafts” and the women get an hour of community service and it counts for their rehabilitation program, she said. Covert said she has led the crafts since they have been partnered with CROSSWAEH. She said each week they do a planned craft, which can be anything from crotcheting items such as hats, scarves, wash clothes or purses to making toy crafts that can be put in the shoe boxes. “We do something different every week,” Covert said. In addition to visiting weekly, Ramsdell said with permission from CROSSWAEH, the women are allowed to come over to the church for the annual packing party. Ramsdell said the group also tries to include a photograph in every box of the CROSSWAEH ladies and church members to give them a personal touch. She said when they first started parterning with CROSSWAEH, they thought it would help the women and give them something positive, healthy and productive to do. Ramsdell said they were floored by how much the church members were blessed just by working with the women. Ramsdell said church members also have learned a lot about the American incarceration system and about the drug addiction problem. “They are brave and we are proud of them for completing the program to go home and make a new life for themselves and their family,” Ramsdell said. She said after watching the videos, it is on her bucket list to go overseas and help the locals distribute the boxes. “It brings tears to my eyes how much it means to these children to receive these gifts. To see them pull out a rubber ball and scream with joy or a pack of pens and pencils and they can go to school. (Knowing) I can have a small part with that is just amazing and it is a miracle,” Ramsdell said. Covert said what it means to play a part in Operation Christmas Child is hard to describe. “It makes me feel really good to help these kids that don’t have anything and just to bring some joy into their life,” she said. Ramsdell said members of the church individually pack boxes and then they bring them in and put them together as well. There is no target goal, they just make as many as they can do, she said. People can donate money online at www.samaritanspurse.org. “Then, those volunteers usually have a distribution party where they invite children to come out and they all get them and open them at the same time,” Ramsdell said. It costs $9 to ship each box and anybody can contribute money that will go toward shipping, Ramsdell said. To donate, call the church at (419) 447-9518 or send donations to 2531 S. SR 100 and label it for shoe box shipping.